In the wake of Eric Garner’s death, many athletes have used their platform to bring attention to this case by wearing “I Can’t Breathe” T-Shirts. On Saturday, the Notre Dame women’s basketball team donned the shirts before their game against Michigan. 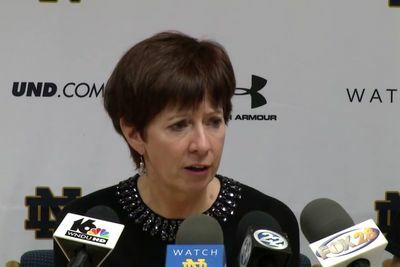 And their coach, Muffet McGraw, talks about how proud she was for her players taking a stand and willing to “fight”. After Notre Dame’s 70-50 victory over Michigan on Saturday, there were many that took note of the Fighting Irish players wearing the “I Can’t Breathe” T-Shirts before the game. Here is their head coach Muffet McGraw discussing how proud she was of her team and their willingness to “fight”.